Gefen's multi-format audio/video processors are compact and powerful presentation switchers with cutting edge format conversion and scaling abilities. They support input and output resolutions up to 4K with HDCP. Their unique features include an intuitive and elegant web server interface, an easy-to-use on-screen display (OSD), IP (Telnet and UDP) control, RS-232 control, IR control, independently password-protected user and administrator access, advanced EDID management, a wide variety of video inputs including Mac and PC compatible DisplayPort, independent and configurable audio and video routing, input selection via contact closure, assignable input naming, and a compact form factor that can be surface or rack mounted, or placed on a shelf. Multi-format audio/video processors features full compatibility with the Gefen Syner-G™ software, including Discovery, Show-Me, and IP configuration. 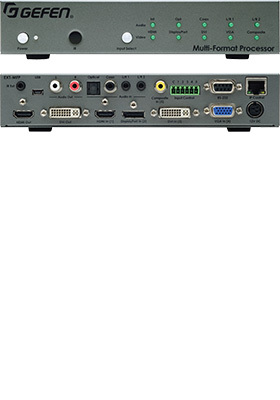 Gefen's multi-format audio/video processors are a complete and cost-effective solution for managing video and audio in classrooms, conference rooms, command centers, and as the backbone of any other high performance system that needs to interface with multiple sources, AV formats, and resolutions in a dynamic environment. Gefen's multi-format audio/video processors can be controlled via the front panel push buttons or the included IR remote control, in conjunction with their on screen display. They can also be controlled via their web server interface, IP control (Telnet or UDP), or RS-232.